The 3 BIG Questions about the Oral-B Pro 3000. If you are short of time, the answers to the following 3 questions should let you know all you need to about the Oral-B Pro 3000. If we have missed something, let us know in the comments. If you want more detail, you can read our full Oral-B Pro 3000 review further down the page or watch our video review. No, it is a good brush which we have given a rating of 4/5. A mid-range model is the Pro 3000. It has more than the entry level and less than the premium models. Few criticisms of it, the biggest question is it best for you? 2. Which other brushes should I consider in this price range? If you focus on features for the price paid, then the Oral-B Pro 6000 is generally the better buy and is our recommendation over the 3000. 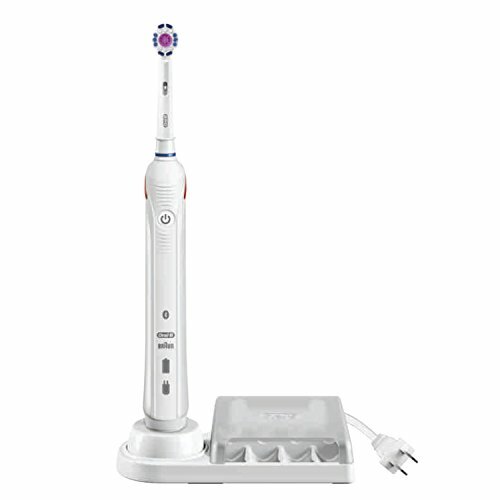 For those not needing the extra box contents or not interested by the smart features of Bluetooth connectivity the much cheaper Oral-B Pro 1000 is a better alternative. Not fussed by brand and want more options? You may like to check out our recommendation for best mid-range electric toothbrush. 3. Where’s the best place to buy the Pro 3000? There is not necessarily one best place to purchase the Pro 3000 from. We have listed some of the most popular retailers below, and it’s always worth checking out eBay, too. Amazon tends to be one of the most cost effective outlets with free shipping and many other offers. The Pro 3000 with Bluetooth looks to be a great option that sits in the higher mid-range of the Oral-B lineup of electric toothbrushes. It is not the cheapest, basic and most functional nor is it the most expensive, feature rich and most desired model. Whilst there is little to fault with the brush particular it is the value and features of other models in the range that ultimately makes this brush a bit bland and not particularly distinguishable. For me, unless someone can persuade me otherwise from all the time I have spent testing other brushes, the only REAL appeal of this brush is that it is the first in the Oral-B range to offer the ‘Sensitive’ cleaning mode which many dentists do recommend. 3 cleaning modes – Offering more than the standard ‘Daily Clean’ which is what the vast majority of users need and actually use, the Pro 3000 is the first brush in the Pro series to offer up the ‘Sensitive’ cleaning mode that many dentists recommend. It does too offer ‘Gum Care’ mode which means this brush is suitable for those who have slightly more advanced oral health care needs and where a standard daily clean may not always be appropriate. A slim profile – The Pro 3000 is an easy to use brush that fits comfortably in the hand irrespective of your age and movement in your fingers. Well designed contours and rubber grip stop the brush from slipping when wet. Timed Clean – An audible warning when to change quadrant and when the 2 minute cycle is complete. Bluetooth – This is a very modern, clever and interactive way to clean your teeth and make sure you do so properly. American Dental Association (ADA) approved – Passed strict lab tests to achieve ADA and American National Standards Institute-approved dental standards. Battery Status – No indication of how much power is in the brush, unless the battery is near to being depleted. Battery Life – Up to 7 days life or 28 minutes of usage time which is weak in comparison to a Philips Sonicare brush which can last up to 3 weeks. For a mid range brush one could argue this is not acceptable. What likely reads as my lack of warmth to this brush is helped somewhat by the white rubber grip that runs centrally down the front facing part of the brush handle. Understandably the performance of the battery life is depicted by the size of the battery but where the battery life could be considered a weakness, the slim profile of this brush is what makes it appealing. Measuring a maximum height of 23cm and no more than 3cm thick, this brush weighs in at 130g when the brush head of your choice is attached. Using the same body as any other Pro or TriZone brush with the exception of the Pro 7000 is of plastic construction with the exception of the aforementioned white rubber grip. The physical size, shape and weight works for young adults through to seniors. High gloss white plastic on the rear is typical of a dentistry product but it’s clean and easy to maintain. A series of contours run from the upper third of the brush down the back of it to provide texture and grip in the hand when wet. Amidst the white rubber in the lower third just below white Bluetooth, Oral-B and Braun logos sit two opaque icons, one of a battery and one of a charger. The first illuminates red when the power remaining in the battery is low whilst the latter illuminates green when the brush is charging. Both are quite bright but sadly neither provide a percentage (%) so you can really tell what power remains and how complete the charge is. In the upper third of the brush handle is the power button which is accented using a white coating to create a prominent power button. Surrounded by grips in the rubber panel the button is responsive and tactile. Activate the brush with a single press of the power button. A second press will launch gum care cleaning mode with a third launching sensitive. A fourth and final press will power the brush off or alternatively just press and hold the button for 2 seconds in any clean mode to turn it off. Spin the Pro 3000 around and just as the brush handle tapers up towards the brush head is a dark red plastic panel that is built into the bod and sweeps around and down towards the front of the brush. If you are not already aware, this is the panel that illuminates red if ever too much pressure is applied during brushing. You may well notice the sound of the brush motor straining and slowing down if you do apply too much pressure, but you will also see from the red light that you need to reduce the force you are applying. Doing so will deactivate the sensor. The bristles of the brush should virtually skim the surfaces of the teeth and do not require a lot of force. A standard brushing cycle is for 2 minutes which is the recommendation from dental professionals. During the 2 minute cleaning cycle the brush will provide an audible warning via a slight pause in the brushing at 30 second intervals to tell you to change quadrant. This is your built in timer. The brush continues to operate at the end of the cycle, unless you turn it off. The pause at the end of the 2 minutes is a little longer to signify to you it is the end of the clean. Brushing for the full 2 minutes is very important, but just as important if not more so is the right technique. Make sure you learn how to clean your teeth properly. You should also note that it is vital to clean your teeth at least twice a day. Always try to leave 45-60 minutes after eating before you decide to brush. The 3000 offers Bluetooth connectivity, a feature seen on the higher end brushes like the Pro 7000 and Genius 8000. It is a clever addition that makes the toothbrush feel more current and fitting of 2017. You can download the Oral-B app for iOS or Android from the relevant app store and pair it with your electric toothbrush. With the 3000 as soon as you power on the brush, Bluetooth is activated.Ensure Bluetooth is active on your smartphone each time you want to use it and the two devices will communicate and provide a reliable means for transferring data. You can essentially build a cleaning history and diary of performance and the app can work as a coach to improve your oral health care. You can have the brush programmed to offer selected cleaning modes and have the app prompt you for flossing and rinsing your mouth with mouthwash and more. It will also show you on screen at the time of cleaning how long you have been brushing for and what quadrant you should be in. The app is very powerful and also comes with handy integration with your calendar, news, tips and tricks so you stay interested when cleaning your teeth. Although on occasions it can be a bit distracting from you ensuring you brush correctly and you may want to customise the settings to avoid some notifications. The really good thing here is that the brush stores some data. It is quite possible you will not have your smartphone with you each time you brush your teeth. The brush will retain data from the last 20 cleans and feed this back to the app when it next communicates. For some this will be a gimmick, for others, perhaps younger buyers the addition of Bluetooth is too good not to have. I love the principles and what it encourages but unless you habit is to really have your phone with you each time you brush your teeth then most of the advantage is lost. Included with the handle is a 3D White brush head, which can help achieve whiter teeth in a matter of days, thanks to the dentist inspired rubber polishing cup that adorns the centre of the brush head. Whilst this head can function on any of the 3 cleaning modes, it works best with the whitening mode, that this model does not have. If you are moving to an electric toothbrush for the first time, like a manual brush, an electric one needs replacing too. The only difference here is that with an electric toothbrush it is just the head and not the whole handle. Remember to change your brush head at least once every 3 months or sooner. Any longer than this and the brush head may actually do more damage than good. Official Oral-B brush heads, the bristles will actually change colour and fade as they get older and are used more. So if your bristles look a bit faint then likelihood is, you need to replace the brush head. Interchangable are the brush heads with the Pro 3000 you can pick up alternatives if you prefer. The Pro 3000 comes with a brush head storage compartment that can store up to 4 brush heads and fits alongside the provided charging stand to give a neat home to the brush and the heads. Great for when not in use. The internal battery on the brush lasts for some 28 minutes and can be left on the provided charging stand most of the time if desired. As a moulded brush with a virtually all in one design, maintenance is not simple on this brush other than a rinse and a wipe. However it should not really be required. Should something go wrong, there is as standard a 24 month warranty is provided with the Pro 3000. This covers the battery too. I commented earlier in this review how as a mid range brush this offer little to really stand out from the crowd. Battery life could have been one place in which it did, but due to the design ethos of Braun, the 3000 offers just 28 minutes of usage time or up to 14 cleans. The considerably more expensive Pro 7000 will add nearly half as much again but their size and weight is impacted. I pick fault with the battery life a little because Philips do a stellar job with their brushes that offer up to 3 weeks usage time compared to a rather poor 1 week from Oral B. In truth, 14 cleans worth of battery life for most of us is sufficient. Rarely are many of us needing it to last longer, as the charger is either close to hand or we leave it on the charger the whole time. Longer usage time would of course just add that little extra appeal. Imagine being able to take your toothbrush away whilst on holiday without needing to worry about taking the charger. All white in colour the charging dock itself has a small prong on the top which aligns with a recess in the bottom of the brush handle and will charge the brush fully in about 8-12 hours. I tend to leave it on charge overnight. When charging the battery charging icon flashes green. When power is low the battery status icon will flash and you will likely feel the decrease in brush power. It is quite safe to leave the brush on the charging station/dock all the time, but do be aware this could reduce the batteries performance over the years. The Pro 3000 has a recommended retail price of $80-100 but for some time now, including as we write this review you can very easily get this at 10-20% less with no real effort. We have listed some of the best buying options here. At the time for writing prices vary from $68 through to $110 but the average price is about $85. Paying anything more than $85 is too much in my opinion and I would only suggest paying this if you know this is the brush for you. Tempted but not sold, at $60-$70 maybe it is more justifiable. This brush like every other requires replacement brush heads for each user every 3 months. Replacement heads can be purchased in various pack sizes -2, 3 and 5 brush heads – and are priced on average between $18-20 for the most cost effective 3 pack. Using the average cost (based on one user) and ownership over 3 years, the Pro 3000 will cost $162 in total or $0.15 per day to own. This price does exclude the cost of water, toothpaste and electric to charge it, but you get a rough idea and is one of if not the cheapest decent electric toothbrushes available at the moment. The more advanced Pro 6000 comes with more features, including better battery life and is similarly priced. Recommended retail price of $80-100. Check list of retailers here. Whilst we have tested the Pro 3000 for a few weeks, like we do with all brushes here at Electric Teeth, other Oral-B brushes have been on test with us and thousands of users for many years. I personally have a brush that is still going fairly strong after 4 years of use between 2 people! A robust design and construction we can be pretty confident in that if you opt for the Pro 3000 or any other Oral B brush it is quite likely it will still functional 4 or 5 years down the line, with a regular rinse and wipe down. We have however reviewed and priced this on 3 years of ownership as semi-regular replacement of the brush is good practice to take advantage of improvements in battery and cleaning technology. The weakest point is the battery. After repeated charges and discharges it can fail and should it, they are not easy to replace. Because it is an internal battery, should it fail within 2 years or any other part, unless user damage it will be covered. The Pro 3000 comfortably sits within a space between the Pro 1000 and the more premium Pro 6000 that are available. However in my opinion whilst a very good brush ultimately fails to deliver on the value when you compare it to these other options albeit cheaper or more expensive. Do not get me wrong the 3000 is a good brush and is one of the best at meeting the needs of a select number of users such as those who want a gum care or sensitive mode and would like Bluetooth but wish not to, nor can afford the all round better Pro 6000. The 3000 has a place, if it did not it would not sell like it does ,but it is limited. Need a sensitive mode but tight on budget go for this. Want a brush with more than one cleaning mode but suitable for all the family, go for the Pro 6000. Is the Pro 3000 an oscillating brush? No, it has just three cleaning modes Daily Clean, Gum Care and sensitive. For more cleaning modes consider the Pro 7000 or Genius 8000. If you want less, the 1000 offers just one mode. We explain all of Oral-B’s cleaning modes in this post. The brush head that is supplied with the Pro 3000 is usually a 3D White head. You can change the head with any others on offer from Oral-B. There are many that work with the brush handle. There are 6 main brush head options that include Cross Action, Floss Action, 3D White, Sensitive, Precision Clean and Deep Sweep/TriZone. Does the Pro 3000 have a pressure sensor? Does the Pro 3000 have Bluetooth? Does the Pro 3000 come with a warranty & how long is it? If purchased new from an approved retailer the Pro 3000 will come with a 2 year warranty. Does the Pro 3000 have a built in timer? The battery lasts up to 28 minutes, which if used on the standard daily clean mode is 7 days based on 2 cleans per day. No, the Pro 3000 does not have a wireless smart guide included. Consider the Pro 7000 for this. Yes, a charging station is included with the Pro 3000. The Pro 3000 charging station or brush head holder has not been designed to be fixed to a wall. Can I use the Pro 3000 in the shower? Yes. The Pro 3000 is waterproof so if you choose you can use it in the shower. Avoid long periods of exposure to water and do not immerse in water. No, a travel case is not included in the box. Do you own or have you used the Oral-B Pro 3000?